Today, in the bustling world of e-commerce on eBay, retail spying continues just as in the old days when successful retailers like Gimbel and Macy spied on each other to figure out ways to get a leg up on the competition. Dipping into the intrigue of surveilling the competition is as easy as clicking your mouse. Say that you’re the biggest Dukes of Hazzard fan ever and you collect Dukes of Hazzard stuff, such as DVDs of the show, movie memorabilia, General Lee models, and lunch boxes. Well, good news: That piece of tin that once held a lunchtime PB&J may very well fetch a nice sum. To find out for sure, you can do some research on eBay. 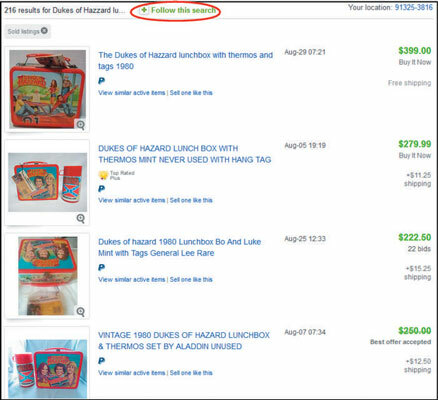 To find out the current market price for a Dukes of Hazzard lunch box, you can conduct a sold listings search and find out exactly how many Dukes of Hazzard lunch boxes have been sold in the past few weeks. You can also find out their high selling prices and how many bids the lunch boxes received by the time the auctions were over. And repeating a completed search in a week or two is not a bad idea — you can get at least a month’s worth of data to price your item. The figure shows the results of a Sold items search sorted by the highest prices first. You can easily save your searches for pricing research on eBay. Just click the star next to Save Search link at the top to add a search to your favorite searches. Then it’s on your My eBay Lists page, and you can repeat the search with a click of your mouse. Look at the pictures on item pages for each item that your sold listings search turns up. That way, you can confirm that the items (lunchboxes, for example) are identical to the one you want to sell. And when you do your research, factor in your item’s condition. Read the individual item descriptions. If your item is in better condition, expect (and ask for) more money for it; if your item is in worse condition, expect (and ask for) less. Also, note the categories the items are listed under; they may give you a clue about where eBay members are looking for items just like yours. If you want to be extremely thorough in your comparison selling, go to a search engine to see whether the results of your eBay search mesh with what’s going on elsewhere. If you find that no items like yours are for sale anywhere else online, and are pretty sure that people are looking for what you have, you may just find yourself in Fat City. Don’t forget to factor in the history of an item when you assess its value. Getting an idea of what people are watching, listening to, and collecting can help you assess trends and figure out what’s hot.